An examination of the mind’s capacity for creativity and the world of music converged at Tuesday’s “Sketches of Miles: The Workshop” performance at the USC Brain and Creativity Institute. 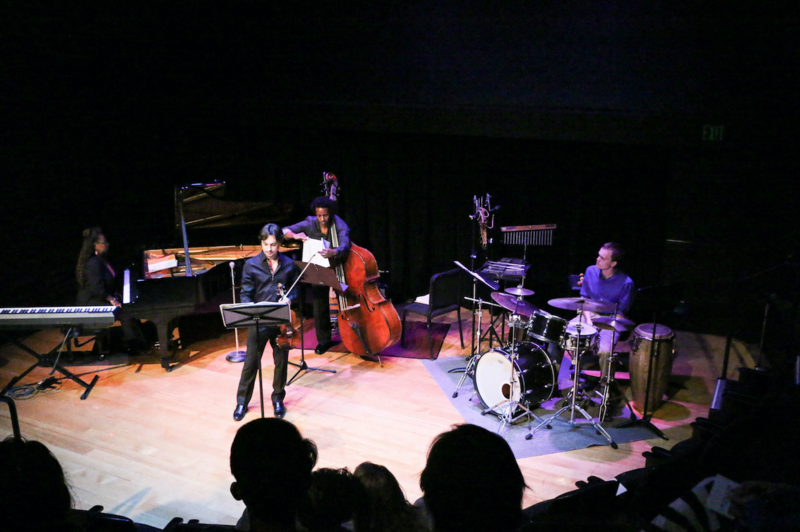 Hosted by the Thornton School of Music, the event was commissioned by the Institute and featured works from Bach to Miles Davis in an exploration of how two seemingly disparate genres of classical and jazz can come together to create something new and captivating. After the performance, the musicians — comprising violinist Etienne Gara, pianist Patrice Rushen, percussionist Ian Wurfl and bass player Edwin Livingston — had a conversation with the Thornton dean Robert Cutietta and the BCI director Antonio Damasio. Davis is a representative of the institute itself, as one of his paintings that he produced near the end of his life hangs in the lobby of the institute. Damasio explained how he wanted Gara to put together a program that brought together the classical and jazz styles, while still keeping Davis in mind. The moderators were particularly interested in the the challenges of mixing the two different styles of music. Gara emphasized that while the styles may be different and musicians may react to music differently, all genres share a common theme of humanity. Imagery was also particularly important to their creative processes. Wurfl discussed all the preparation that went into the arranging of the pieces, before the musicians could even begin to think about how they played with one another. As the panelists opened the discussion, a few audiences members chimed in during the discussion to reflect on their listening experiences. One described the difference of the two concerts that were going on simultaneously — the visual and auditory — and that she experienced the music much differently when she closed her eyes. Another felt that music was telling a story, as there were lilting elements in the compositions. Thomas Mellan, a first-year graduate student majoring in pipe organ and composition, was impressed by the performers’ ability to combine the two genres, as he’d never heard something like it before. When asked what he hoped people would take away from this performance, Gara provided some advice for people with creative aspirations.